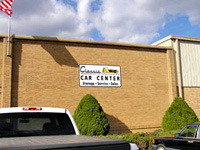 Classic Car Center's nondescript building offers no real hint as to what's inside. Ownership of a classic car has many rewards and anyone who has one can tell you about all those situations where people have complimented them, engaged them in conversation or simply given a "thumbs up." It's a great hobby and, for the most part, pure enjoyment. They are looking for someone reputable to work on their cars, whether it's only a simple tune-up, major mechanical work or restoration. They want someone they can trust to do the job correctly and for a fair price. The snack bar is designed after an old-time diner. They need to find storage space for their car (or collection) that is secure, climate controlled and accessible. Ideally, they would like their cars to be kept in a driveable condition, such that they could stop in on short notice and take the car out for a day, weekend, etc. They want to sell their car but are either too busy to handle the logistics or would prefer to consign it to a place that would keep the car secure, in running condition and the people in charge could market it in the most effective manner. One of two large storage areas. This on for those who want to have continuing access to their vehicles for those Sunday afternoon drives. Two businessmen/classic car lovers have created a center that not only satisfies those three problems but does much more. 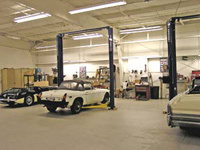 Martin Miller and Garland Gentry have opened the Classic Car Center of Fredericksburg, VA, a large facility devoted to providing a full range of services to classic car owners. Service is performed in the Center's 5,000 square foot facility that's fully equipped to handle anything from oil changes to full restoration. Storage for scores of cars is climate controlled, open 7 days with full time staffing, has 24-hour security, fire suppression systems and warm-up and fluid checks. Vehicles for sale are housed in the same facility and are always kept in running condition, licensed and insured. 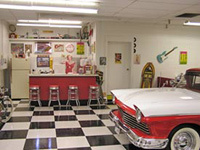 Classic Car Center's well-equipped restoration shop. That means a great deal to the car buff because anyone wishing to examine a for-sale car is assured that it will be presentable and functional, as opposed to a "basket case" or something worse. 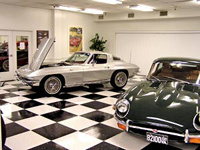 Here are a couple of cars that Classic Car Center is selling for their clients. The Center has a great recreation room. It's decorated in a 50s-60s motif and couldn't be more cheerful. Clubs and other organizations are invited to hold receptions or parties or meetings in the facility - at no charge. This business plan makes a lot of sense to us at SCG. The facility is strategically located, right off I 95 at Fredericksburg, Virginia, the most densely traveled interstate in the US. The Center is accessible to a large percentage of the East Coast population. Mild winters and long seasons allow for easy logistics. Check it out at www.classiccarcenter.net or give them a call at 888-370-4474.